For generations, Henry F. Miller pianos have been built with a standard of craftsmanship, beauty, and value that is becoming increasingly rare. All action parts are fashioned from hardwood — no plastic parts. All soundboards are made from select solid spruce. Hammers are covered in high quality German felt. Hand-crafted and hand-rubbed. Henry F. Miller's collection of popular styles gives you a wide variety from which to select and an instrument to suit your tastes in design and color. Play and compare — you'll find Henry F. Miller pianos deliver top performance at an outstanding value. You can be sure that your investment in a Henry F. Miller piano will reward you with years of treasured musical experience. 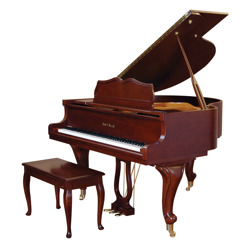 Click here to browse Henry F. Miller pianos. We believe so strongly in Henry F. Miller pianos that we give every purchaser a Lifetime Guaranteed Trade-back certificate. 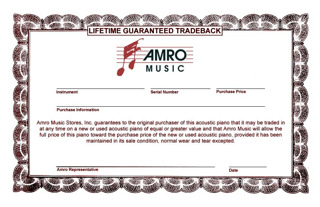 The certificate states that you can trade your Henry F. Miller piano back to Amro at any time and Amro will give you everything you paid for it toward the purchase of any piano of equal or greater value.